First things first. I absolutely love this nail polish in the shade "Deep Wine - 160"! Red nails has been my love for November and I cannot get enough of them! After falling in love with their pink shade "It's not my name - 380" which I featured in my June favourites I believe, I couldn't help but go back to the Miss Sporty range in Superdrug to see what new shades they have in and this one just shouts Christmas at me. It is insanely beautiful! I'm sure you have seen this palette every where but I couldn't help but mention it! Recently I have been reaching for this palette for the most and I forgot how much I loved it! It of course is the "Fortune Favours the Brave" palette by Makeup Revolution and as you can see, it features matte and shimmer and all of the beautiful colours in between. If you haven't got your hands on this, you need to find it! The lovely ladies from Amie Skincare kindly sent me their exfoliator recently and I have fallen in love with this. I have never used an exfoliator before. I've always been so wary about my sensitive skin and break outs but I haven't had any issues with this product! If I've had a break out, I have used this in the evening before bed and my spot has either decreased in size or has disappeared over night, it's incredible! For £5.95 for a beautiful cake smelling exfoliator, you just cannot go wrong! Full review coming soon. 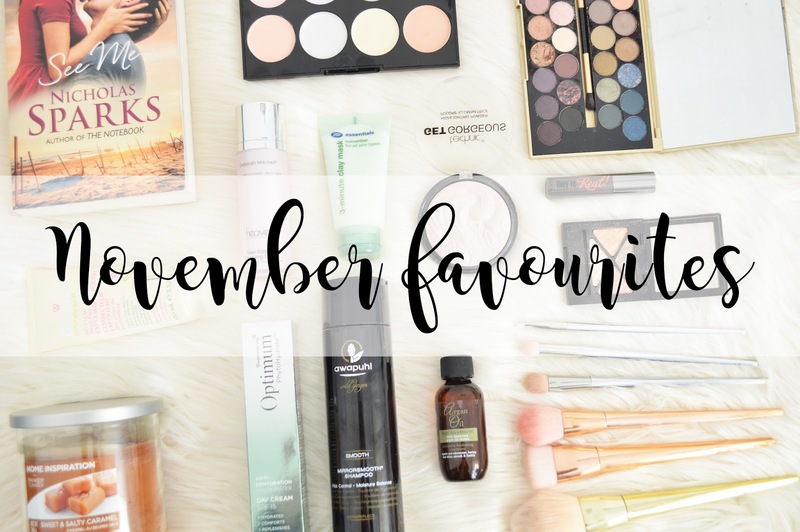 I cannot write about my monthly favourites without including a book and this month I have been reading Nicholas Sparks "see me" and honestly, it's one of my favourite books so far! As always I will be writing a full book review (once I have finished the book) but if you want a good read for December, then get your hands on this! You can find it in supermarkets for less than £4 which is a bargain! If you follow me on Instagram, you'll know how much I love this candle as I have featured it previously, but I feel like it's the most appropriate candle for Winter time (apart from overpowering gingerbread of course). Yankee Candle's are my absolutely favourite candles of all time and the candles which you can pick up from places such as Asda and Sainsburys are just as incredible! This smells like a bakery, but a caramel bakery. If you can just imagine what that smells like! It's not too sweet, and it's not too strong either! If I could have a perfume that smells like this, I would wear it all day long! And I'm not lieing either. I recently purchased these brushes which are incredible for the price! They look like the Real Techniques bold metals, right? And very dirty ones too! But they're not. I found these on Ebay and couldn't help but buy them and give them ago, and honestly the quality is probably just as incredible as the Real Techniques brushes, but for so much cheaper. They're soft, they blend my makeup easily and they are easy to clean too! You just cannot go wrong with them. Being a student, I also couldn't afford the real deal! I was also recently kindly sent the Heaven Skincare New Edition Cleansing Cream and when I say recently, I mean about a month and a half ago! I really wanted to test this product out to see how incredible it can be and I have been reaching for this every evening when I wash my face and go through my evening skincare routine. I wouldn't say the scent of this cleanser is exactly wonderful, but it's not dreadful either. It's a beautiful consistency, it isn't oily and it leaves my skin feeling silky smooth like a babies bum! It really has transformed my evening routine. If you have seen my Paul Mitchell Review you'll know how much I love their Awapuhi wild ginger range. It smells beautiful and it leaves my hair looking and feeling absolutely amazing. I'm not going to go in-depth but I wanted to just say I have been loving the Wild Ginger range as part of my hair care routine and if you want an anti-frizz shampoo and conditioner, definitely check out this range! You can also find my full review here. I have been absolutely loving the Rimmel London Glam Eyes Quad Eyeshadow Palette. I was recently sent this as I won a giveaway on twitter and ever since I have loved it and used it every day! How I hadn't seen this before, I have no idea! It's beautiful and perfect for this time of the year! I have found this eyeshadow palette has absolutely no fall out and the shades are pigmented enough for me! They are also so easy to blend, it doesn't take a lot of work compared to other eye shadows I have used! I love it and thank you so much to Charlotte for picking me as a winner for her giveaway. Colour corrector palettes haven't always been my favourite product to use. I have tried the Collection palette and found the products made my skin very dry and I'd end up with flaky skin by the end of the day! Technic's colour corrector palette is completely different to the Collection one. The products are light, but extremely creamy. They're easy to blend and they last all day long! I have also found these cream products haven't left my skin flaky and dry by the end of the day. For £5, can you really go wrong with a palette like this? I personally have been loving it! Are you looking for a beautiful new highlighter to add to your makeup collection which is also affordable? Look no further! The "Get Gorgeous" Highlighter but Technic is only £3.49, what a bargain! This highlighter is one of the best highlighters I have used so far! It's so pigmented and for the price, wow! It's also one of them products which you just don't want to stop looking at because it's so beautiful. I was so reluctant to touch this as I didn't want to ruin how it looked! But I'm so glad I did try it out as it's now part of my daily makeup routine! Superdrug are absolutely wonderful and kindly sent me a bunch of products and this beautiful coconut scented day cream was included in the fabulous package! This is their Optimum Birch Water Day Cream which you can currently pick up for £7.45 instead of £14.99! Grab it whilst you can! I have been absolutely loving this day cream as 1. It smells like malibu, mm! 2. It isn't oily! and 3. It makes me face feel incredible. I will be writing a full review of this product, as well as featuring it in my winter evening skincare routine so make sure to keep an eye out for these posts! This is a fantastic product! Last but not least, I have been loving another skin care product! The wonderful Boots essential 3 minute cucumber clay mask! I picked this up from Boots using my lovely O2 Priorities App! They were doing a deal a while ago where you could pick up a free product from their cucumber brand and I just had to choose the clay mask! I had never used a face mask before the day I picked this up and I then questioned why I never had. Of course, it's because I'm so anxious to try face products because of having eczema and sensitive skin! But, my skin has been loving this clay mask! I use it once or twice a week when I need a bit of a pamper and I'm sure my face loves me for it. Of course it's drying, because all face masks dry but it's a really nice feeling. It smells good, it makes you look like a witch and your face feels great afterwards. What more can I say about this, apart from go try it!